The research group of Electrochemical and Surface Engineering -SURF- is part of the department of Materials and Chemistry –MACH- in the Faculty of Engineering at the Vrije Universiteit Brussel. 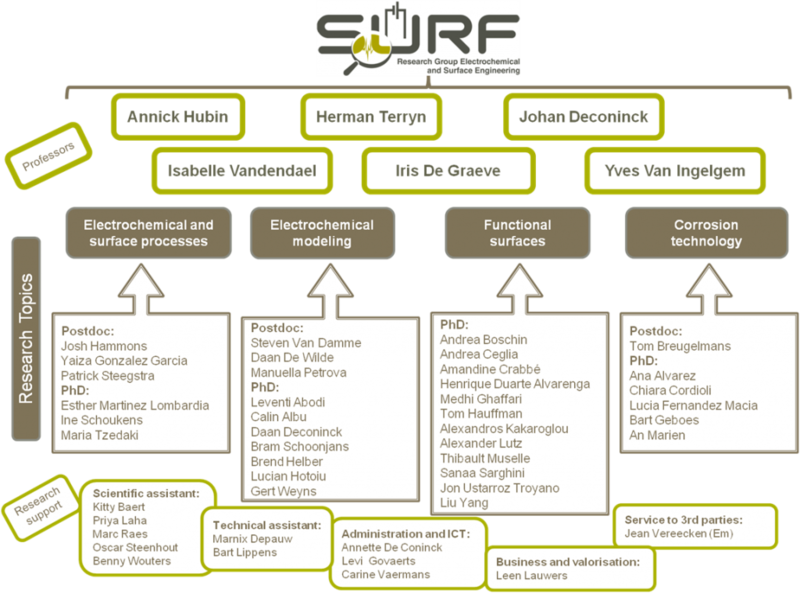 SURF concentrates its research around 5 cross-linked areas in electrochemical engineering, (nano) surface engineering and their combination, each supported by dedicated professors. The SURF group counts on and off around 55 people of which 3 fulltime professors, 4 part-time research professors, and on average 8 postdocs, 25-30 PhD students, and 12 technical, scientific assistance and administrative staff members. Together these people form a World class community actively in pursuit of excellence in electrochemical and surface engineering. SURF is recognized as IOF Centre of Excellence within VUB. In all the research fields a multiple research strategy is employed based on complementary macroscopic and local electrochemical methods, computational software for process simulation, and in-situ/ex-situ surface analytical techniques (vacuum and optical). SURF is in the unique position of having advanced technology of all these research tools in-house. SURF has research collaborations with research institutes and industries in Europe, Japan, America and Australia.